For transmission of alarm messages via SMS. The alarm thresholds (the lower and upper warning points) can be set using the software supplied. The GSM module enables the transmission of alarm messages by mobile phone or fixed network, using SMS. An activated SIM card is needed for this. There must be sufficient reception strength at the installation location. The connection to the GSM module is done via po-tential-free contact (connection to the remote alarm device as pictured below) in a refrigerator or freezer. The GSM module has two digital inputs allowing two refrigerators or freezers to be connected at the same time. A temperature sensor is available at an extra cost for connecting refrigerators or freezer that don’t have a potential-free contact (connection via analog input). The alarm thresholds (the lower and upper warning points) can be set using the software supplied. An optical and acoustic alarm is triggered at the GSM module when a threshold value is reached and an SMS alarm message is sent (consisting of freely definable text). 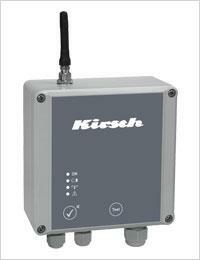 The acoustic alarm is confirmed at the GSM module by pressing a button or via sending a confirmation by SMS. The optical alarm remains until the fault has been cleared and additionally confirmed. Further details are provided in our product description below.